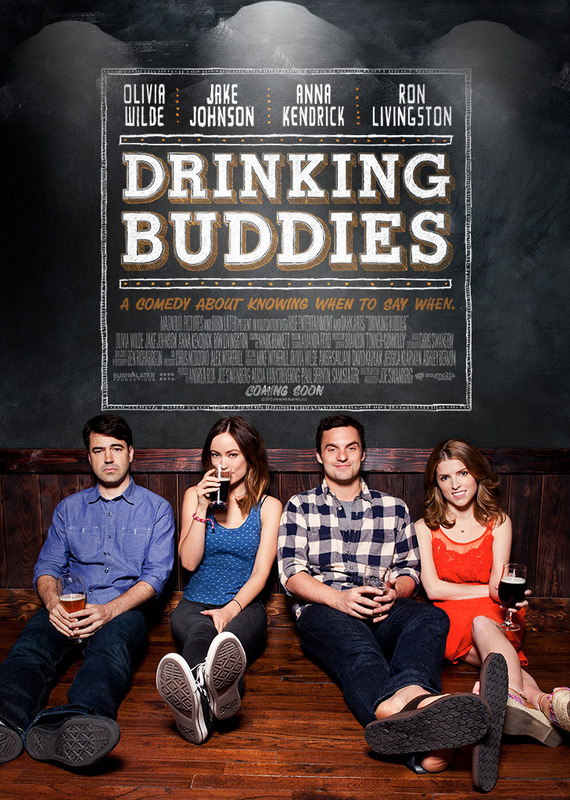 Drinking Buddies is a movie about love, friendship, and beer that was written, produced, and directed by Joe Swanberg and features some outstanding performances from the likes of Jake Johnson, Olivia Wilde, Anna Kendrick, and Ron Livingston. There is also lots of beer. 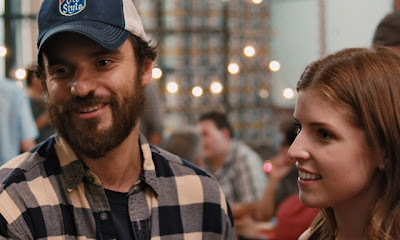 Kate (Wilde) and Luke (Johnson) have worked together in a brewery for a long time and, if it wasn't for each of their own relationships, one might think they could be even more than just friends. There is clearly a bond between the two although Luke is very happily engaged to his fiancé Jill (Kendrick) and has no intentions of jeopardizing their future. Meanwhile, Kate is enjoying her relationship with her latest boyfriend Chris (Livingston), even if he isn't quite as enthusiastic as she is. After the two couples hang out and get to know each other at a work party, they decide to take a weekend getaway trip to Chris' cabin that involves lots of beer, hiking, beer, bonfires, wine, swimming, beer, card games, and more beer. Actually there is beer in nearly every scene of the entire movie, but that's not important right now. What is important is how emotions start to get mixed up and things start to happen that weren't necessarily supposed to happen. These unexpected happenings send the four single-syllable-named individuals through a roller coaster ride of emotional turmoil that has each of them questioning who they are, who they are with, and what it all means in the grand scheme of things. That may sound a little heavy for what looks like a heartfelt comedy, but fortunately Mr. Swanberg really knows what he is doing and, for the most part, manages to keep things moving along nicely. I say "for the most part" because there are more than a few times during the movie where I felt it got bogged down in its own drunken wallowing and could have benefitted from a little less bad decision making from all the primary characters. I know this is supposed to be a very realistic portrayal of what humans go through when they are emotionally unstable and dealing with different types of relationships, but I myself prefer a little more Hollywood style storytelling thrown in to keep it from being too much like the real life that is happening outside the theater doors. There is something to be said about actually having fun while watching what is supposed to essentially be a comedy rather than ending up feeling depressed and frustrated by how the overly dramatic story unfolds. 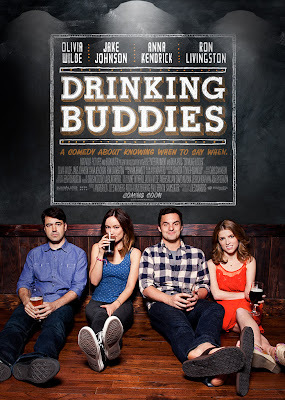 What keeps this movie from stumbling into mediocrity is how Olivia Wilde and Jake Johnson absolutely nail their performances as characters you want to either hug or strangle depending on which scene you are watching. They each really manage to shine in these roles and their chemistry on screen is undeniable. Apparently, a lot of the dialog was improvised to give a more realistic feeling and I have to say it worked very well for these two in most situations. Ultimately, Drinking Buddies is a slice of life, not-quite-romantic comedy that manages to not drown in its own sorrows and ends up being more entertaining than it probably should be. 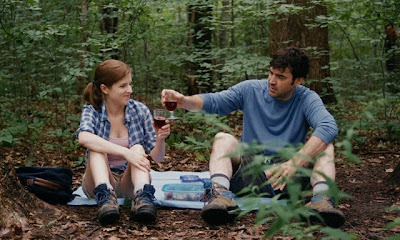 Joe Swanberg comes close to delivering the goods, but doesn't quite get there even with a couple breakout performances to work with. I imagine this will end up being one of those movies you really either fall in love with or want to walk away from as quickly as possible.